There is a saying in english, ”passing the buck”, which means the act of attributing one’s own responsibility to another person or group. 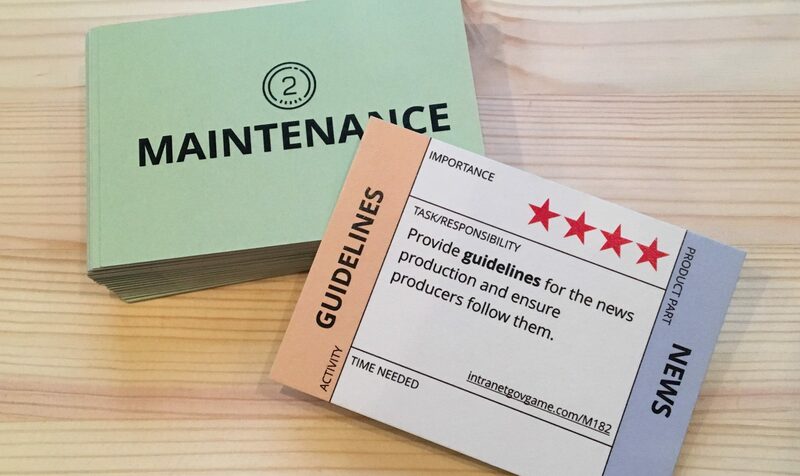 The Intranet Governance Game aims to end the buck-passing related to intranets. The game clarifies what needs to be done when taking care of an intranet. The Intranet Governance Game consists of several game boards and 126 cards (plus six free cards). The idea is that the intranet team and the intranet owner + line manager play the game. Every card is an intranet task. The mission is to distribute the cards (=tasks) among the intranet team members. Tasks not relevant, tasks no-one can do or tasks that do not fit within the collective time available are put on the table game boards. Cards placed on a team member’s board becomes the job role instructions for the future intranet work. The game makes it really obvious for the team who’s responsible for what and for the manager and owner what the team has to manage every week. It also creates discussions about what tasks are most important, what the team can stop doing and a consensus about the team focus. And it stops the buck-passing within the intranet team!